A decade after the Battle of the Breach, the world has rebuilt much of what was lost to the Kaiju invasion, with Jake (John Boyega), son of fallen war hero Stacker (Idris Elba), making a life for himself as a criminal, entering forbidden areas to steal items from junked Jaegers. During one of these explorations, Jake meets young Amara (Cailee Spaeny), an orphan with gift for piloting homemade Jaegers. Eventual capture by the PPDC forces Amara to join Jaeger training, honing her gifts alongside other recruits, while Jake rejoins the Ranger program he abandoned, reunited with rival Nate (Scott Eastwood). Working to get a handle on their drifting skills, Jake becomes a mentor for Amara, but their abilities are challenged by a Chinese corporation looking to introduce a fleet of drone Jaegers to help protect the world, partially masterminded by Dr. Newt (Charlie Day). When a rogue drone emerges from the deep, bent on destroying anything that tries to challenge it, Jake and Nate team up inside a Jaeger to figure out what’s going on, fearful that the Kaiju are about to return to Earth. “Pacific Rim” had its light moments, but del Toro aimed to create a moodier showdown between the forces of good and evil, often staging big battles in the dark and during rainstorms to add some texture to potentially monotonous fighting and possibly cover CGI seams in the process. “Pacific Rim Uprising” does away with the shadows, moving ahead as a shiny, colorful creation with a more pronounced attitude, finding Jake trying to keep his distance from the legacy of his heroic father, eschewing the military life for parties and crime, making the most out this post-Kaiju world. Boyega plays the role with his high beams on, working very hard to be the liveliest element in the frame, taking leading man duties seriously. Jake’s a wiseacre and a reluctant soldier, and much of the screenplay tracks his progression in the Jaeger program, returning to military duty, which involves playing nice with Nate and dealing with Amara, who can’t focus on her drifting abilities due to childhood trauma, requiring Obi-Wan work from her new friend to make it as a Jaeger specialist, surrounded by multicultural team of recruits, some living to bully her. Cinematography by Dan Mindel is sharp and bright, immediately separating the sequel from its predecessor, and the screenplay tries to connect to del Toro’s vision for this universe, but eventually gives up, more interested in the comic book nature of the premise than the fantasy threat. The drone idea has potential, but there isn’t much to the subplot besides introducing Chinese influence and actors in an obvious bid to make the feature more appealing to Eastern audiences, while the return of Dr. Newt isn’t entirely welcome, with Day as squeaky as ever, struggling to remain the comic relief he once was. The screenplay offers cliché, with broken people refocusing their lives and facing their fears inside the Jaegers, and dialogue exchanges are often dreadful, stapling unnecessary words all over scenes that merely require silent reactions. 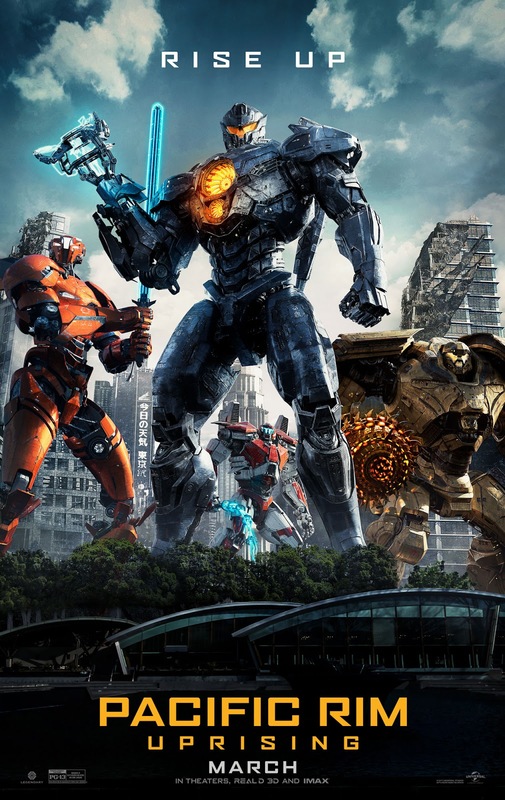 If there’s a simple desire to watch robots battle other robots, well, perhaps that’s all anyone should expect from “Pacific Rim Uprising.” Co-writer/director Steven S. DeKnight puts primary focus on daylight conflicts between metallic creations, showcasing all kinds of weaponry and flexibility, taking the Jaegers to a few different countries to duke it out. With lowered expectations, the movie does okay with large-scale mayhem, keeping explosions and grunted approvals from the drivers coming throughout the blessedly shorter picture. Expecting something grander from DeKnight is sure to inspire disappointment, as the production seems determined to steer the franchise in a direction that allows for a more explicit, Disney Channel-style distinction between good and evil, hoping to trigger a plainly rousing response to conventional spectacle than what del Toro could muster with his idiosyncratic ways. 0 Komentar untuk "Pacific Rim: Uprising (2018) Review [EN]"